Faced with unparalleled grief, will Jonah return to Elohim? Parents are looking for fiction that makes Christianity exciting for their kids. This series is the first Christian answer to Percy Jackson, the Kane Chronicles, the Secret Series, and other middle grade series packed with action and adventure. But the message is solidly based in Scripture, conveying that God is always in control. 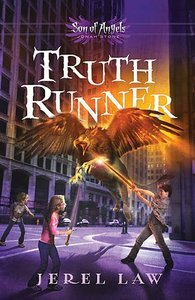 In Truth Runner, Jonah has left Angel School and attempts to forget Elohim's calling by moving back to his hometown and starting high school as a "normal" kid. But Jonah can still see fallen angels-and the evil they're doing. When Jonah realizes the Fallen are attacking his friends without their knowledge, he is faced with a choice: continue to ignore it and forge his own path, or remember who he really is and fight for his friends. As Jonah's story begins to resemble his Biblical character's namesake, will he turn back to Elohim's path for his life? About "Jonah Stone #04: Truth Runner (#04 in Son Of Angels Series)"
Jerel Law is a gifted communicator, pastor, and church planter with eighteen years experience working full-time in ministry. He holds a Master of Divinity degree from Gordon-Conwell Seminary and began writing fiction as a way to express his faith and communicate Godâs love to others. Law lives in North Carolina with his family.